sauce – Love your own cooking! 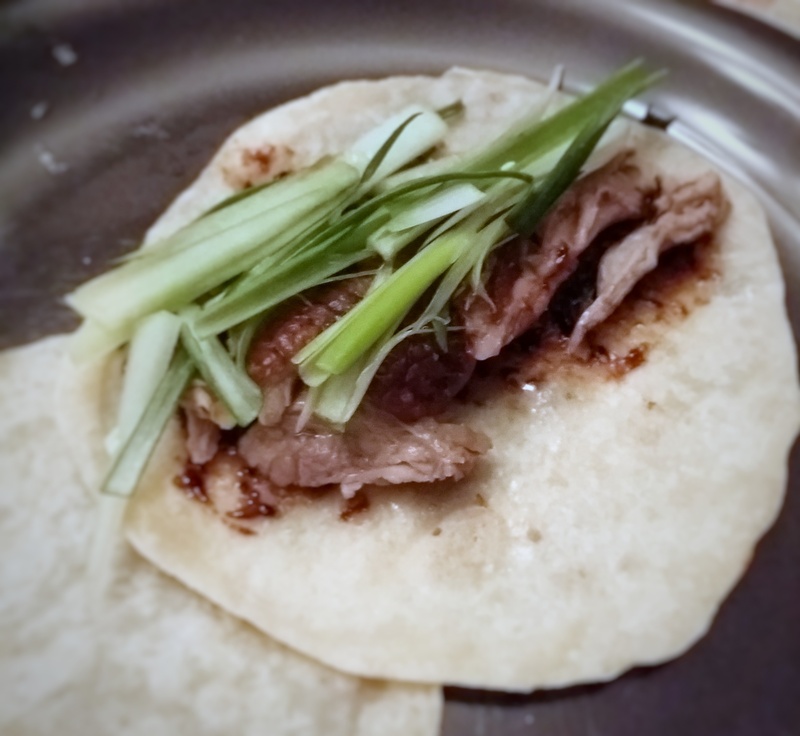 I had Peking Duck in Beijing, China for the very first time when I was three years old. It was my first trip to the capitol. I vaguely recall taking a really crowded, slow-moving train, standing on top of the Great Wall, running up steps in the Forbidden City and feeling incredibly hot and uncomfortable at the ruins of the Summer Palace. I’d go into detail about each other those spots, but this is a food blog, after all, so let’s focus on the food. It wasn’t until 2008 when I’ve made my home in the US for a few decades, that on a return visit to Beijing that I tasted the real thing again. My husband, Dave, was with me on that trip and his response very much mirrored my own. Dave was adamant that we recreate that experience at home. I’ve tried. For several years now. 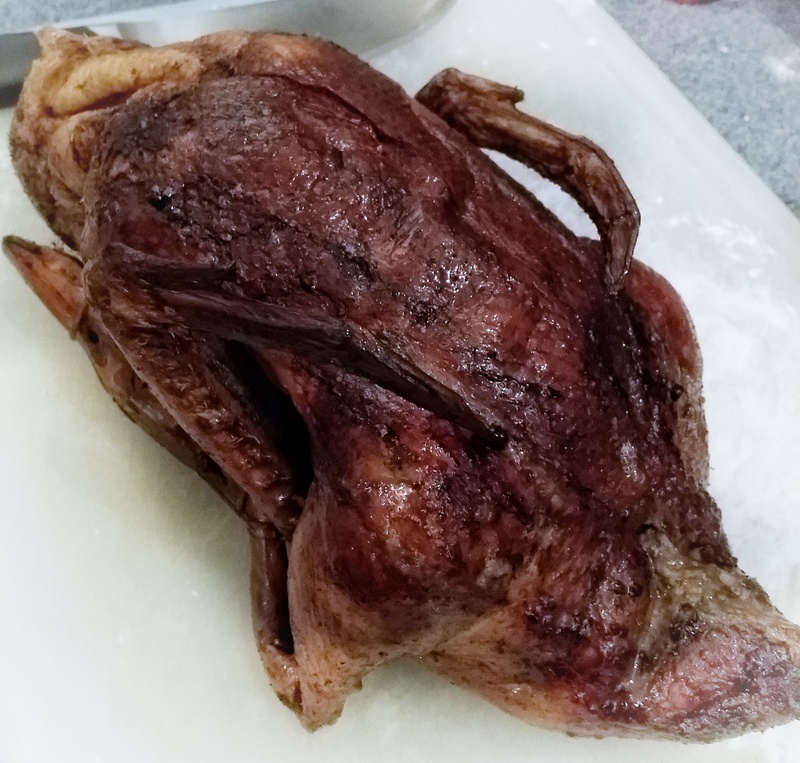 At first, I roasted my ducks (headless from Wegman’s or H-Mart) on a Cuisinart Roaster with Rack like a slab of rump roast. 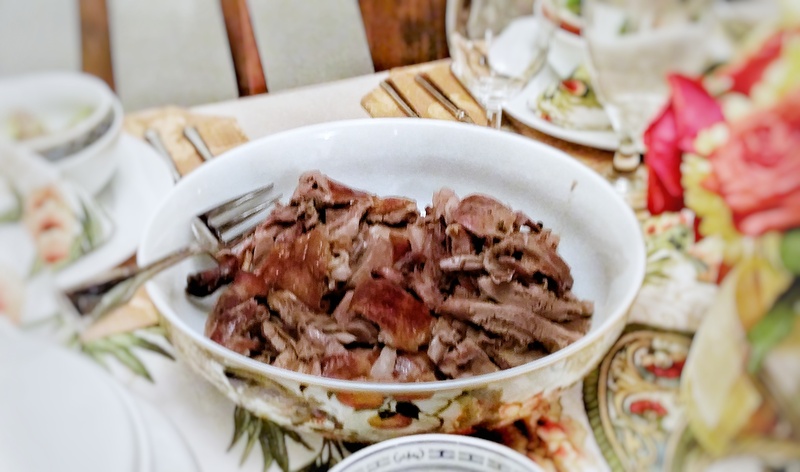 While the meat was flavorful, I could not recreate the crispy skin that comes with hanging a duck in an open oven so that its fat rendered out, slow roasting the meat, yet leaving the skin as crispy as a potato chip. But I kept trying. Dave created a contraption out of string that shall never be mentioned again. 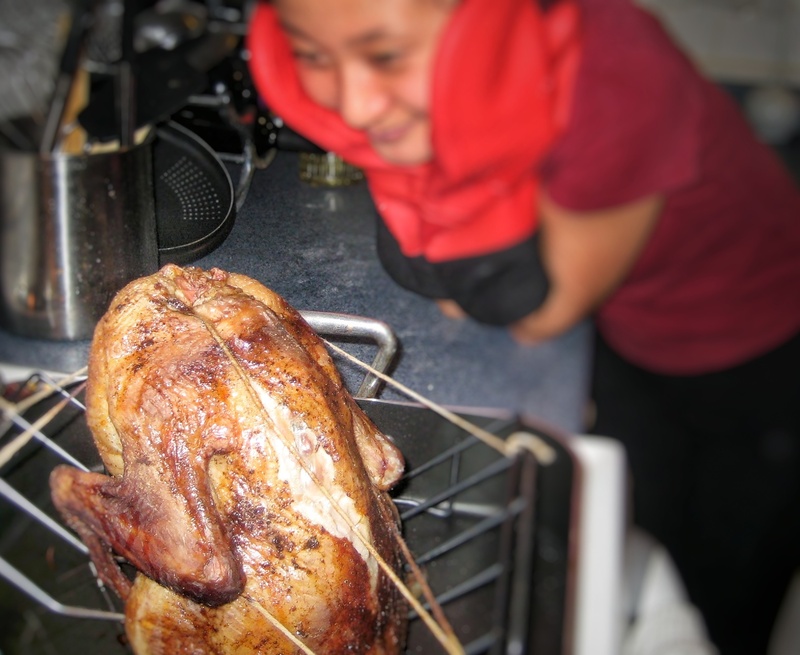 Then we found Chinese groceries that sold the duck with the head on and we fashioned it so that we could hang it by the neck in the oven. Better. Much better! Once upon a time this meal was only served in the imperial court, to the guy living there, so mentally prepare yourself. This recipe is not for the faint of heart. It takes time and preparation. I recommend studying this recipe until it makes sense. Once you buy the ingredients and start the process, it’ll be too late to turn back. 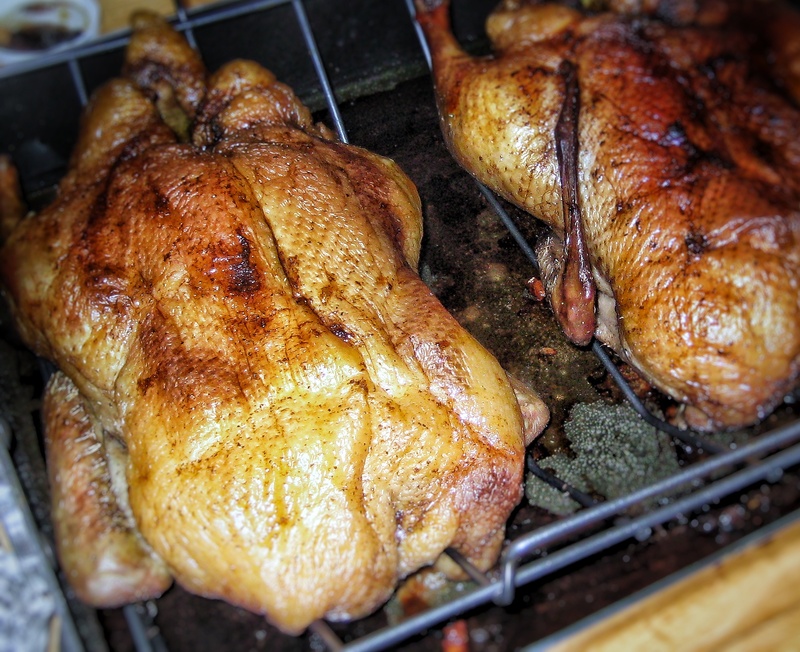 My Peking Duck in a regular oven. Part 1 — Prepare 5 days in advance. 5-6 stalks of scallions, white part cut off and sliced into slivers. 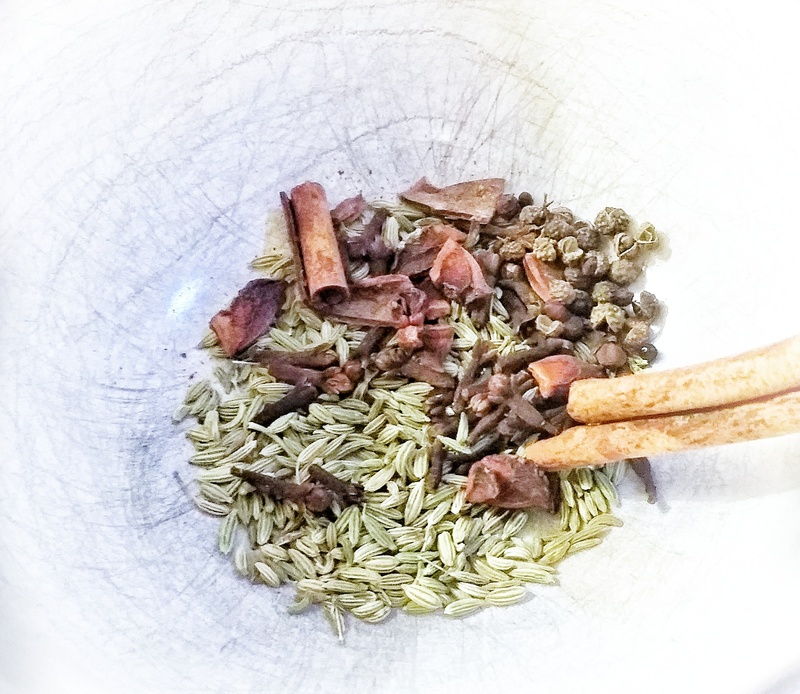 Take half of the 5- spice ( star anise, fennel seed, clove, cinnamon, peppercorn) blend w/ salt, molasses, green portion of the scallion, garlic and ginger. Stuff in the cavity. Use a bamboo stick to sew the cavity up. 4. Separate skin by inserting a straw through a small slit cut into the base of the neck and blowing vigorously. The skin should balloon and separate from the body. Flip, cut another slit and blow again. 6. Set on a baking rack over a cookie sheet and dry for 5 days in the fridge. 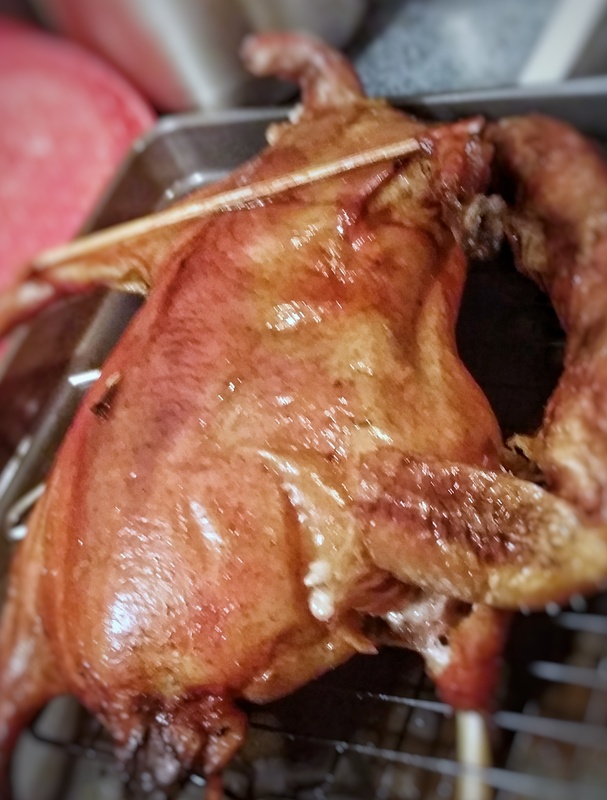 When it’s time to cook the duck, let it rest at room temperature for up to 1 hour. Cooking time takes 2 hours, so prepare by setting your oven racks as far apart as possible. The duck will be hung by the base of its neck using a metal hook from the top rack. Place a roasting pan on the bottom rack to catch all the rendered fat drippings. Turn the oven to 350 degrees F and roast for two hours. After two hours, turn up the oven to broil on low for 10-15 minutes. This should crisp up the skin, but not burn it. Check often. 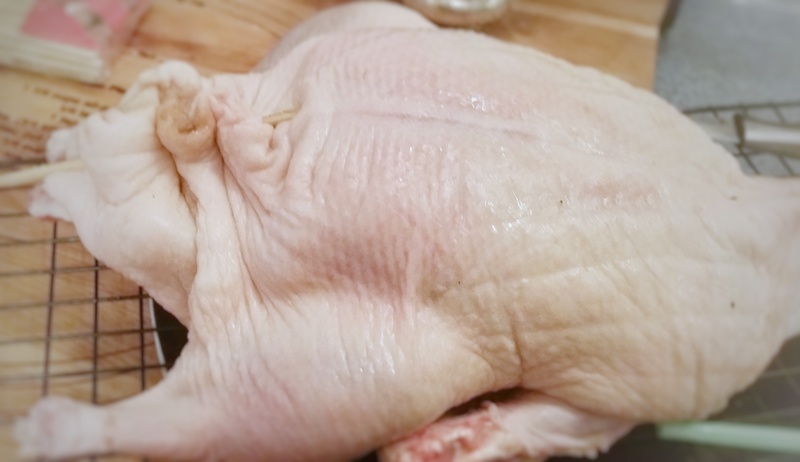 Be careful removing the duck from the oven as it will be sitting on top of a pan full of scalding hot duck fat. Carefully slide the top and bottom rack out slowly until the duck can be easily removed from the hook. Let the duck rest for 5-10 minutes before carving. My pancakes are still being perfected, so I won’t share it just yet. However, the dark sauce that goes with the duck can easily be made with what is called a Chinese noodle sauce, honey and a bit of water.